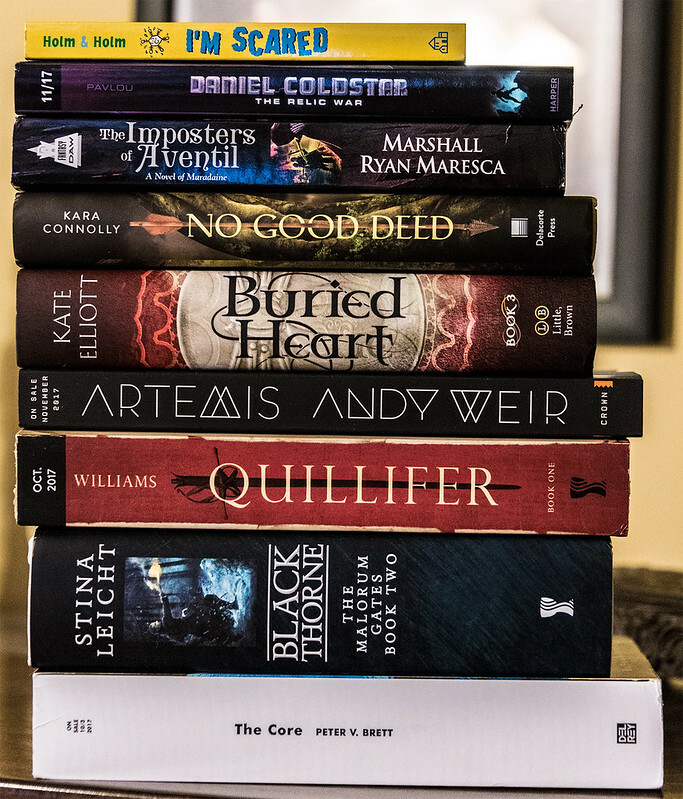 As we ease on into another summer weekend, here are the new books and ARCs that have come to the Scalzi Compound this week. What do you like here? Share your feelings in the comments! Well, I do love me some Andy Weir, so I’m going with Artemis, too! Ooh. Andy Weir wrote another book. Time to put it on my list. I read Daniel Coldstar: The Relic War and really enjoyed it! I’m going to continue a running theme here: Artemis! Imposters of Aventil for me! Barnes and Noble has signed copies of Artemis for Pre-order. I just finished an egalley of Artemis and I really enjoyed it. Imposters & Artemis are both on my to get list. 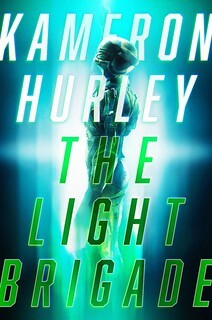 I’ve really enjoyed Brett’s Demon Cycle, so I’m looking forward to The Core. And I almost skipped a party with friends, because I couldn’t put down The Martian, so I’ll give Artemis a try. Wow! Artemis and the Core and Black Thorn all in one week? Buried Heart. Kate Elliott deserves to be much better known – she’s an occupant of the ‘women writing epic fantasy/space opera’ blind spot). I greatly enjoyed the first two books in this trilogy. Read the Artemis excerpt; moved along at a quick clip – got sort of a YA feel to it, however. The “Kenya Space Corp./Kenyan flag of convenience” concept is presumably explained, but it is sort of a question mark … equatorial launch site, or something similar, presumably, but Kenyan sovereignty on the moon/Luna/etc. seems very doubtful. Given that something as complex as the year-round and deep in the continent as McMurdo-DEEPFREEZE-Asmundsen-Scott can only be sustained, diplomatically and economically, by the US today, presumably the FLO-turned-city is going to be an international effort. I’m hopping on board the Artemis train. Weir’s Artemis is just around the corner! QUILLIFER, for sure. Walter Jon Williams under the influence of George MacDonald Fraser? Gimme! For Andy Weir fans, do yourself a favor and check out a short story he posted online years ago called, “The Egg”. ‘Black Thorne’ for sure. I really enjoyed ‘Cold Iron’ and can’t wait to pick up the next one. I’m psyched to see another Andy Weir novel! I think it was Steven Stills of Crosby, Stills, and Nash who once said that the test of a songwriter was their second album. A songwriter had a lifetime of experiences and songs to pack into the first one, so having an initial success would be based on that. It was if they could replicate that success in a second album, without all the history to use and a much shorter timeline to write, that was the mark of a great songwriter. I don’t know if something like that’s true for authors, but if it is I hope Andy Weir’s hit the mark again. Buried Heart. 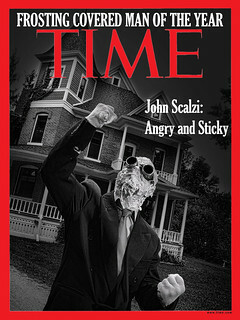 My copy should arrive Tuesday. Third of her “Court of Fives” series. Didn’t know that Walter Jon Williams had a book coming out! I’ll definitely be buying that one. Kate Elliott is high on my to-be-read list, but keeps getting bumped by politics (sigh). And I’ll definitely check out Artemis.